It’s one thing to talk about making a difference. It’s another to actually live it. And we Midwesterners, well, we’re the type to roll up our sleeves and get to work. 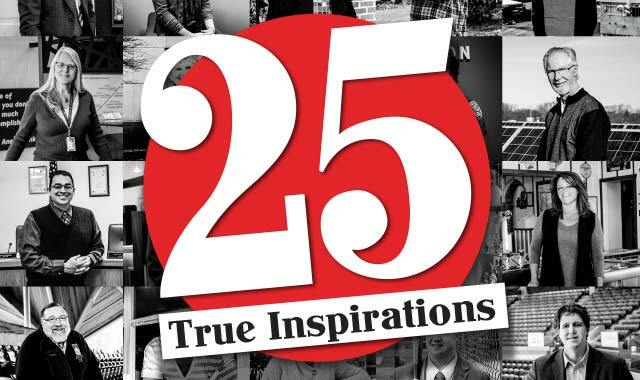 This year, we introduce you to 25 individuals who exemplify the reasons this region is a great place to live, work and play. Russell Johansson, President/Owner, Specialty Screw Corp.
There’s a lot more to Specialty Screw Corp. than meets the eye. The modern Rockford production center where cold-formed parts and fasteners are manufactured for the automotive and other industries incorporates technological advances in manufacturing, energy and waste conservation. 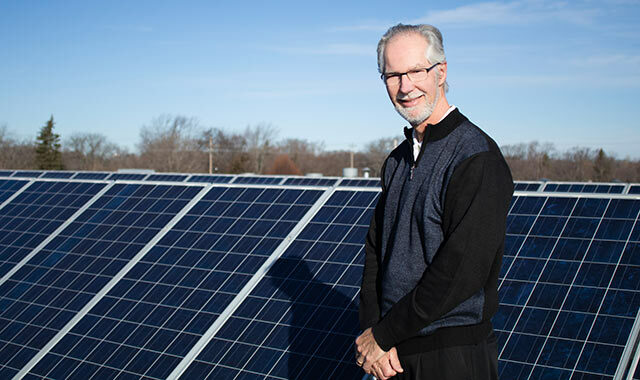 For Russell Johansson, president and owner, environmentalism is a natural extension of his upbringing. His home state, Michigan, was an early adopter of environmental preservation efforts, instituting recycling, alternative energy and conservation laws while developing its tourism industry around clean water and pristine outdoor attractions. After his father purchased Specialty Screw in 1975, Johansson joined the company. He became president and owner in 1993. 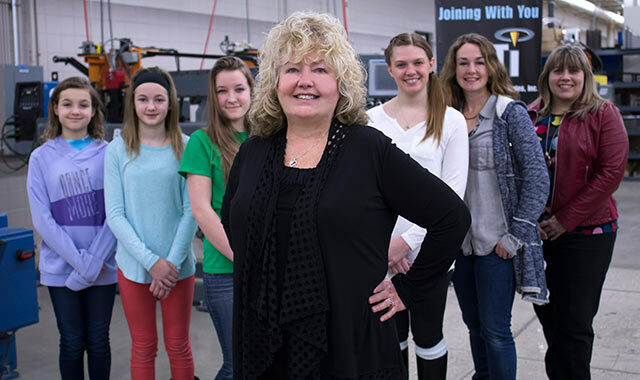 Johansson has invested in equipment, continuous improvement and employee training. And, he’s has focused relentlessly on the conservation of energy, land and water – efforts which have earned him local, state, and national awards. Johansson led an effort in 1996 to take five unused acres of company property and create a native Illinois prairie, now home to wildflowers and wildlife. This prairie helps to divert millions of gallons of rainfall from the storm sewer. Volunteerism is important to Donna Mann. 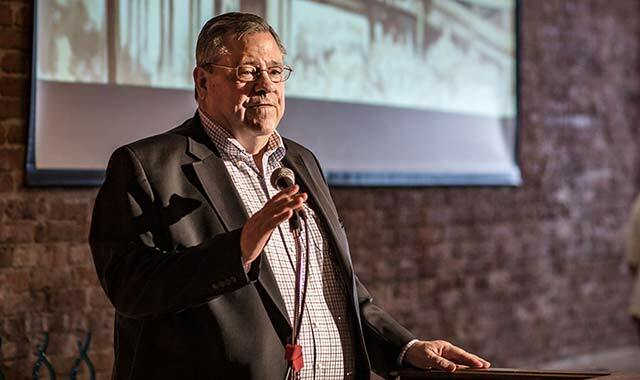 The faithful community servant believes it’s especially important in a small community like Oregon, Ill.
Mann has been involved with many grassroots initiatives in Oregon. 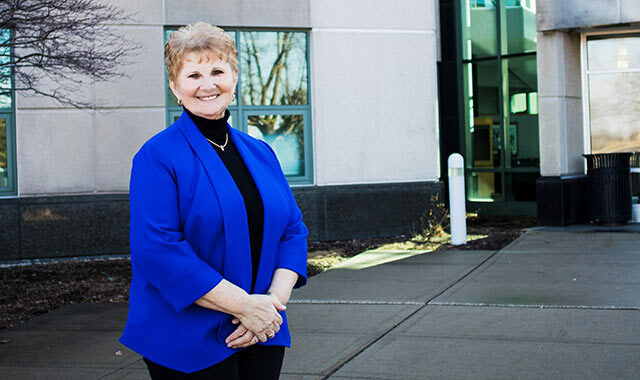 She serves on the Oregon Chamber of Commerce’s Board of Directors and is Co-Chair of Oregon’s Rockin’ River Fest, a June event that features live entertainment, family fun, games and other events on the riverfront. She’s served as president of Oregon’s Autumn on Parade festival for 10 years and sits on the organizing board for the Oregon Trail Days festival. Mann is also working with Oregon Community School District 220 to launch a Rural Crowd Fund project, a new mechanism that will enable the school to fundraise for various projects. In addition to her volunteer efforts, Mann oversees the continuing professional education program at Northern Illinois University (NIU) in DeKalb, Ill. With more than 30 courses covering human resources, facility management, project management, and finance and accounting, this program serves more than 500 working professionals. From her home office in Oregon, Mann hires and trains instructors, builds curriculum and schedules courses. Prior to joining NIU, Mann spent 19 years as an adviser at the University of Illinois Extension office in Oregon. She also spent six years as a community leadership and volunteerism educator at the U of I extension office in Freeport. Her days may be busy, but Mann believes it’s all worthwhile. Austin Edmondson’s teen years were rife with struggles. “That’s why I have a heart for youth, especially those who deal with difficult home lives, depression or difficult backgrounds,” he says. The youth minister at St. Rita’s Catholic Church, in Rockford, welcomes all children, teens and young adults, regardless of their faith background, to partake in the age-appropriate programs he organizes. With help from volunteers, Edmondson creates a safe, fun environment where youth can build friendships, have fun and grow in their own spiritual lives. Edmondson says he felt called to enter youth ministry while attending Benedictine College, in Atchison, Kan. During his second year at the school, when he was studying youth ministry and theology, he dropped out to become a missionary with an organization called Reach, where he planned retreats for middle school and high school students. After spending a year in Montana and another year in Washington state, Edmondson’s missionary work lead to Northern Illinois University, in DeKalb, where he organized large events and led small Bible studies for college students. 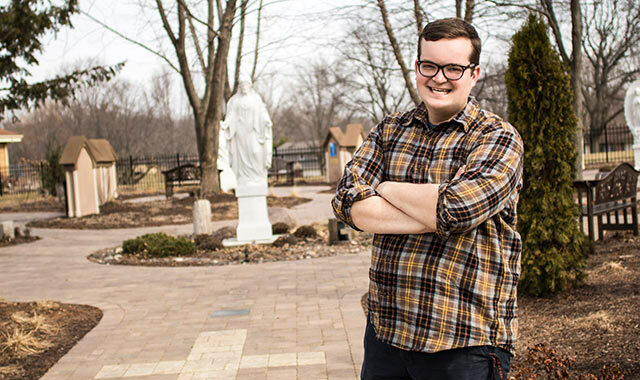 In June 2015, he moved to Rockford to start a full-time position as youth minister at St. Rita’s. He has two main goals in sight. Edmondson has organized mud volleyball games, paint wars and bonfires, as well as Bible studies, prayer services and volunteer opportunities. He also works on marketing, fundraising and administrative tasks during his office hours. When Rob Funderburg learned of his father’s illness in 1990, he demitted from business school at Northwestern University and came straight home to Rockford. Helping out with Alpine Bank and Trust, the family business, seemed much more important than finishing his postgraduate education. 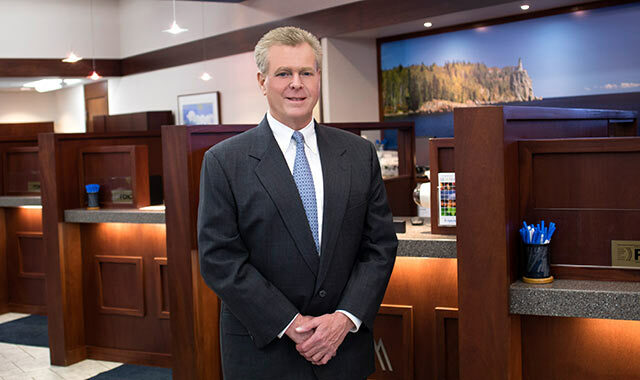 But 27 years later, chairman Funderburg has led Alpine Bank to become the largest community bank serving Winnebago, Boone and DeKalb counties. His employees, customers and shareholders are equally important to him. Providing a professional, fair, honest and fun working environment is just as vital as providing a safe place for customers to save and for shareholders to invest. Funderburg believes in being generous to his fellow citizens. He’s served on numerous community boards supporting education, social services, the arts and economic development. Through his generosity, Alpine Bank supports 350 organizations with $950,000 per year. Funderburg enjoys spending time with his wife and two young-adult children. He’s also outdoors as much as possible. 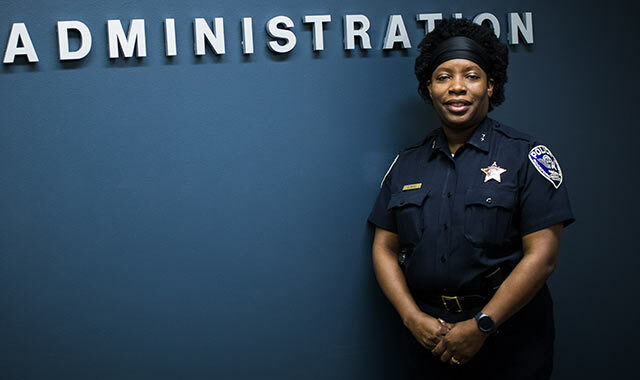 Carla Redd is making history at the Rockford Police Department. Last summer, she was named the department’s first African-American female assistant deputy chief. The year before that, she became the department’s first black female lieutenant. Redd serves as the commander for District 1, on Rockford’s west side, where she oversees the department personnel who work in that part of town. After earning a bachelor’s degree from Northern Illinois University, Redd landed a job as a substance abuse counselor before becoming a probation officer. Several of her friends who worked in the department persuaded Redd to join the force in 1998. Redd worked her way through the ranks from patrol to the community services unit. Over the next few years, she passed a series of tests and climbed the ranks to become an investigator, a sergeant and a lieutenant. Early in her career, there were men who questioned her ability to work in the profession. Being a lifelong resident of Rockford has given Redd more of a connection to the community. “I may be able to identify some of the issues residents experience, because I may have gone through some of the same ones growing up,” she says. She further builds bridges with her community by spending her free time speaking with civic organizations, churches and other groups. The Rev. Kim Moeller didn’t always want to be a minister. In fact, when she was in college, the Ohio native was a biology pre-med major. After graduation, she worked as a marketing manager and meeting organizer, and eventually became executive director for a prestigious tech firm in Silicon Valley. Preaching behind a pulpit never crossed her mind. However, after years of planning meetings and events for tech company CEO’s, she felt pulled toward ministry. She attended Fuller Theological Seminary, in Pasadena, Calif., and worked as a small-group leader at a megachurch. Later, she took classes at Wesley Seminary in Washington, D.C., where she graduated with a master’s degree in divinity. Moeller then worked with a nonprofit group that helped homeless people. When the pastoral position at Swiss United Church of Christ (UCC), in New Glarus, Wis., opened up, Moeller felt a strong attraction to the congregation. She knew she was on the right road after she met with the church’s pastoral search committee. “I have never felt so sure that I am in the place God has called me to be,” says Moeller, who accepted the role in June 2016. She believes her former career path prepared her well for this new role in the church. Moeller is inspired by Jesus’ call to his followers to love and care for others. Inspiration also comes from her congregation. It’s the people, she says, and not the beautiful 117 year-old sanctuary, that makes the church special. Swiss UCC partners with many local service groups and supports children’s education in some of the most impoverished areas of El Salvador. D r. Alex Stagnaro-Green dreamed of heading a small school where he could know every student, impact institutional culture and improve the community’s well-being. When the opportunity arose, he jumped at the chance to become dean of the University of Illinois College of Medicine Rockford. Since his arrival in 2014, Stagnaro-Green has, in many ways, enhanced the learning environment for this school’s 175 medical students, 60 medical biotechnology students, and faculty and staff members. In addition to opening a fitness center and establishing new student programs, Stagnaro-Green has expanded the focus of the school’s research program, including with the addition of a regenerative medicine lab. A graduate of the Mount Sinai School of Medicine and a practicing internist and endocrinologist, Stagnaro-Green is a strong advocate of lifelong learning. He earned a master’s degree in health professions education from University of Illinois-Chicago in 2005. He’s working on a degree in health care administration, which he’s expecting to complete this December. For much of his career, Stagnaro-Green has been an international expert in the link between thyroid disease and pregnancy. He still treats patients, but he also lectures in places around the globe, including places like India, Finland and Spain. He makes time to teach third-year students, too. “That is one of the highlights of my week,” he says. Monthly seminars are just one way the community is connecting with the medical school. Stagnaro-Green is excited about the ties he’s made with city leaders, public schools and numerous organizations – not to mention local physicians who teach here. It takes some imagination to re-envision a building that’s covered in sawdust and raccoon prints. But Ashley Sarver has plenty of imagination. Sarver, 29, joined the staff of Gary W. Anderson Architects about two years ago as an urban planner. She grew up in Durand and earned degrees at the University of Illinois at Urbana-Champaign and U of I at Chicago. During college, she studied abroad in Spain and worked as an au pair in the northern city of Bilbao. The industrial port city used to be dirty and smoggy, but was undergoing a transformation, one that reminded Sarver of Rockford. “It was important for me to come back to where I’m from,” Sarver says. Sarver currently is working with Anderson on a plan for the redevelopment of Keith Creek, a project Anderson started in 2002. The goal then was to create a linear park, but plans dropped off the radar. Sarver is helping to revitalize the plan, in spite of barriers. Patience is a virtue in urban planning. Sarver has toured many of Rockford’s vacant downtown buildings for potential projects. The successful ones take a long time to come to fruition. Sarver’s work outside the office is also helping to reimagine her community. She’s passionate about the Purpose Built Communities initiative, which aims to improve standards of living through education, housing and wellness. She co-leads the Planning team for Transform Rockford and is working on a group called I Bike Rockford that combines the region’s cycling groups. Sarver encourages other young people to have a little imagination when looking at the Rockford region. At 19 years old, Larry Williams had enough of living in Freeport’s public housing. Determined to get his mother into a better home, he got a job at a local call center and then launched a call center of his own. People took notice. He was invited onto the Freeport Housing Authority’s board, and in 2009 was named its executive director. Now, he’s helping his neighbors – not just FHA residents – to realize a pathway out of poverty. In his mind, public housing is a hand up, not a handout. 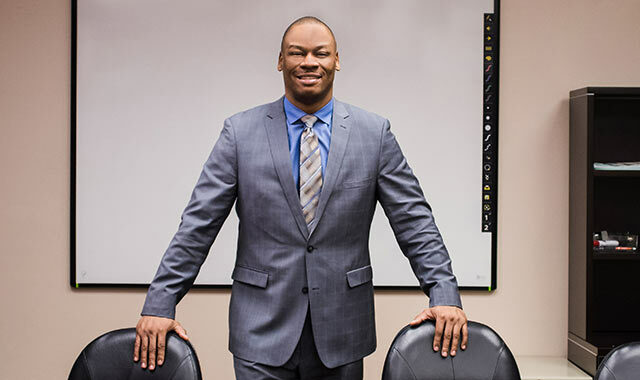 Combining his entrepreneurial skills and his passion for helping people, Williams is raising hopes through his Workforce Development Institute, a classroom program held at FHA that teaches the sorts of “soft skills” that employers most desire. Williams is also a leader in Collaborate Freeport, a group that’s promoting the city’s assets and transforming its sore spots. Williams recently launched Conversations Over Pizza, which draws together community members, local leaders and law enforcement for a “Sunday dinner” dialogue. “What makes Conversations Over Pizza different from other conversations is that we leave with a better understanding, but we also leave with solutions that we can implement,” he says. Williams is eager to empower those around him. 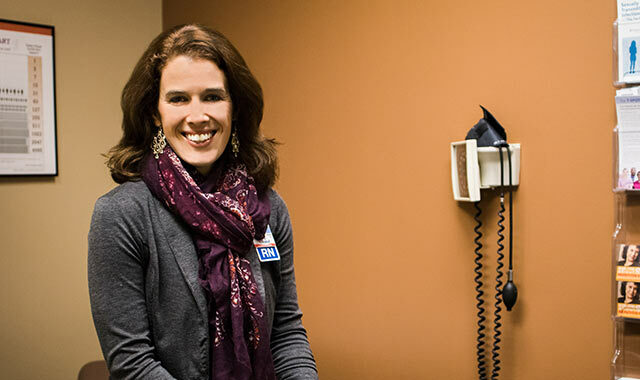 For more than 40 years, Rockford’s SwedishAmerican Health System has been led by physicians. When Dr. Bill Gorski retires this summer, he’ll hand the reins to a fellow physician. “To have someone who knows what it’s like to take care of people and to see and be with patients – that really has an impact on how decisions are made here,” says Gorski. 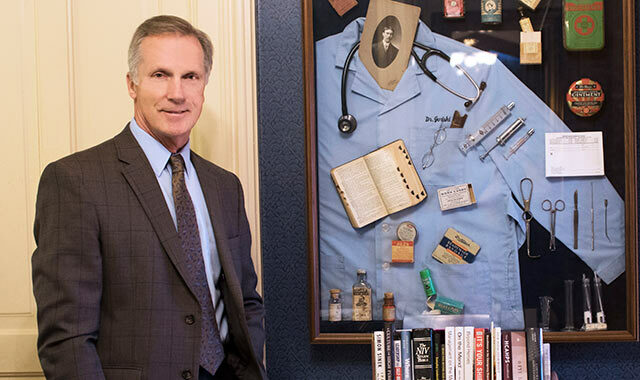 The suburban Chicago native arrived in Rockford in 1977 with his wife, Sue, to serve his medical residency at the University of Illinois College of Medicine Rockford. 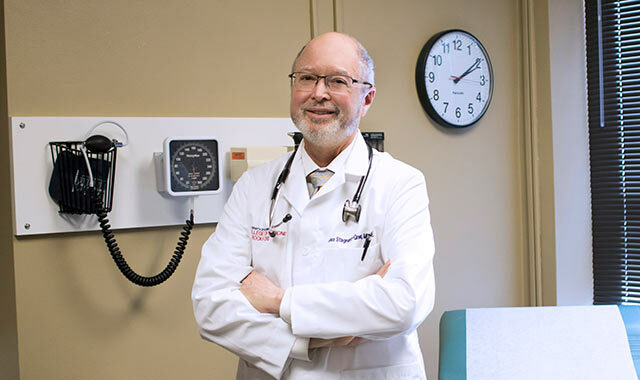 He became a family practice physician with Five Points Family Medicine, and in 1994, when the practice was sold to Swedes, Gorski was tapped to lead the nascent Swedish American Medical Group, which now employs nearly 170 physicians at more than 30 clinics. “It wasn’t like I wanted to get away from practicing medicine, but when [then-CEO] Dr. Robert Klint asked me to take the role, I thought, ‘He needs help. He needs a doctor to lead this new group. Why should I say no to that?’” Gorski recalls. Gorski became SwedishAmerican’s chief medical officer in 2000 and succeeded Klint as CEO in 2001. The past 16 years have been busy for the health system, as it’s expanded its Midtown campus and revitalized the neighborhood, built a heart hospital, established a Belvidere hospital, built a cancer center and merged with UW Health. Despite his many accomplishments, Gorski says he’s most inspired by patients. Outside Swedes, Gorski works with United Way and has been part of Transform Rockford and Alignment Rockford since their earliest days. His four children grew up locally, and though they no longer live here, they, too, recognize the city’s transformation. Two angels in an antique store window started it all. While vacationing in Florida in 1976, Joyce Berg and her husband, Lowell, spotted the angels in a window and purchased them on a whim. The couple began collecting other angels, and in time, they made a formal hobby of it. “It soon became a passion for us; it was something we enjoyed doing together,” Berg says. 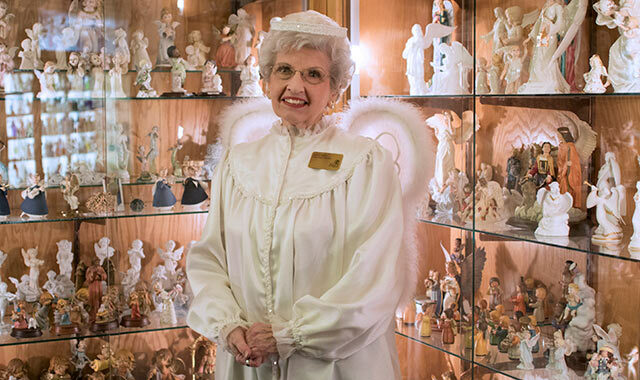 By the time the collection had grown to 10,000 angels, small tour groups began to visit the Bergs’ home, where angels were on display in every room. When people started asking about bus tours, Berg knew she had to share the collection on a larger scale. The idea for the Angel Museum was born in 1994. The historic Beloit church had been closed since 1988 and was set to be demolished, though local parishioners were trying to save it. The Bergs reached out to them and, after a lot of red tape, opened the museum in 1998. Berg continued adding to the collection, even after the museum opened and after Lowell died in 2003. “If you have something in your heart, you keep doing it,” Berg says. She still occasionally buys angels when she’s out shopping – if they “speak” to her. The collection now has more than 14,000 pieces. Surprisingly, there are no duplicates. Visitors will find angels of all shapes and sizes, made from a variety of mediums, including pasta and wood. Television personality Oprah Winfrey donated more than 600 African-American angels, all of which are on display at the Beloit museum. Berg says she’s inspired by the faces of the angels; they make her feel good. She finds pleasure in inspiring others. The State of Illinois charges local health departments with overseeing four areas: clean drinking water, private septic systems, safe food served at food establishments, and diagnosis and tracking for more than 70 communicable diseases. As Boone County’s public health administrator, Amanda Mehl supervises these services for nearly 54,000 residents. With a bachelor’s degree in public health, Mehl started her career in 2006 at the Winnebago County Health Department before earning her master’s degree in 2010. Four years later, Mehl earned a degree in registered nursing at Rock Valley College. She joined Boone County’s department as director of personal health services, and in 2016 she accepted the position of administrator. Mehl describes the department as a dedicated team effort, robust despite its small size. “We are responsible for identifying, following up and reporting such infectious diseases as foodborne illnesses, mosquito-borne illness such as West Nile and Zika virus, tuberculosis, HIV and other sexually transmitted diseases including syphilis, gonorrhea and chlamydia,” Mehl says. Recognizing a gap in disease control, evaluation and patient education, Mehl helped to open a walk-in Sexually Transmited Infections (STI) clinic in 2013. Because of the sensitivity of STI-related incidents, Mehl says, many people, especially young people, do not want family doctors or insurance agencies to know. Those who visit the walk-in clinic can receive risk screenings and testing options on an affordable payment system. Because it’s the only option of its kind in the county, the clinic enables the health department to better track and report occurrences of disease. “The clinic is able to target at-risk residents in a welcoming, nonjudgmental atmosphere where they are seen by a public health nurse,” Mehl says. The health department’s work often is augmented through partnerships with school districts, policymakers, public officials, healthcare providers, first responders and other agencies. 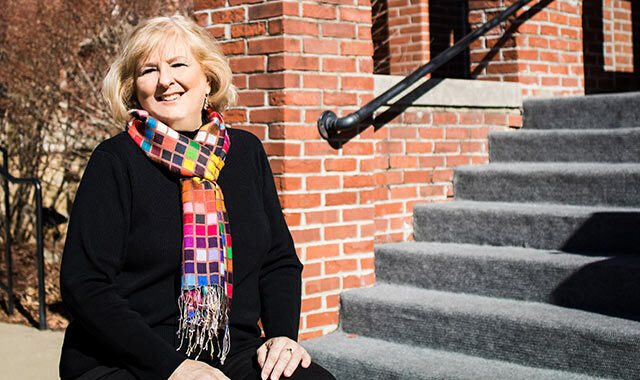 Judy Gustafson dreamed that, when she retired, she’d start a school that met all students where they were – academically and emotionally – and focused on post-graduate life. Gustafson is now living that dream, though not as she might have predicted. In 2012, she left the private school where she’d worked for 13 years and returned to public education, where she’d begun her career in 1974. 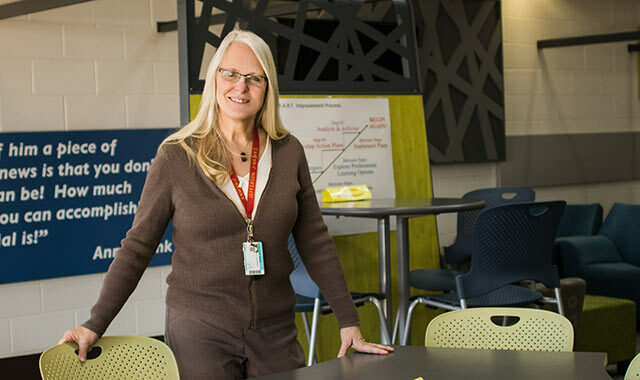 She soon joined Rockford’s Jefferson High School to pilot the academies learning model. Now established at all four of Rockford’s public high schools, the academies model uses small learning communities to help students explore their future plans, regardless of whether they’re headed to college, to a trade school, to an apprenticeship or directly to the workforce. “We knew we could better meet students’ needs, fulfill their life goals, gather around them in a small learning community and give them focused intervention, when needed,” Gustafson says. Students start in the freshman academy, then commit to a career-focused academy for their final three years. Each school-within-a-school focuses on broad career trajectories, including business, arts and information technology; engineering, manufacturing and industrial trades; human and public services; and health sciences. In some courses, students can earn college credits or industry certifications. Community leaders also increase students’ real-world career exposure through activities such as classroom presentations and project assistance, a career expo and visits to businesses. The ultimate goal, says Gustafson, is to impart the value of self-discovery. This may not be the endpoint she imagined, but Gustafson isn’t looking back. Li Arellano, Mayor of Dixon, Ill. Although he’s Dixon’s sitting mayor, Li Arellano Jr. hardly ever sits still. He owns two Jimmy John’s restaurants, is the majority owner of a frozen yogurt company in Rock Falls, Ill., and owns a property leasing company. Arellano also is a sergeant in the U.S. Army Reserves, where he’s served two combat tours in Iraq. He currently serves as a squad leader in the 485th Engineer Company, based in Machesney Park, Ill.
And, he welcomed his third child in February. “Despite my busy schedule, I’ve been able to balance the time constraints of all of it,” Arellano says. Arellano was elected Dixon’s first Hispanic mayor in 2015. 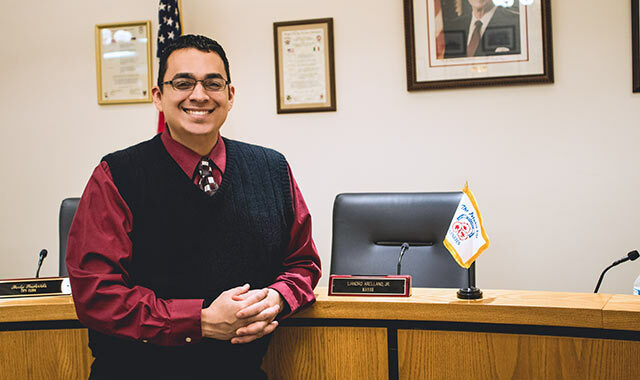 Even as he serves the people of Dixon from City Hall, Arellano could be called to serve his country, on the battlefield, at a moment’s notice. Arellano’s time in City Hall comes during a critical transition as the city moves from a commissioner form of government to a managerial form. The change is part of a broader series of reforms happening in Dixon, as the city cleans up from former city comptroller Rita Crundwell, who was convicted of siphoning nearly $54 million from the city over two decades. She received a 19-year prison sentence in 2013. The well-being of his children keeps Arellano’s battery charged each day. Britney Lindgren has always had positive thoughts of downtown Rockford. For years, the Byron native enjoyed making Rockford-centric prints with her boyfriend, Jarrod Hennis. In 2008, Lindgren joined the screen-printing business he started, Pirate Ninja Print Shop. The popularity of their creations quickly outgrew the vendor booths at local markets. Today, the print shop and Art Deli operate cohesively at 402 E. State St., where people find T-shirts, mugs, hats, bags and more – all including original designs that positively support Rockford. With a degree in graphic design, Lindgren produces concepts for new designs before collaborating with other artists in making those ideas come to life. 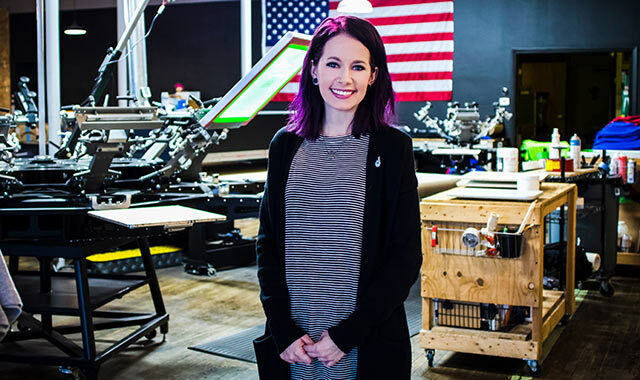 Her idea to start a line of 815 products, inspired by the area’s telephone area code, has led to a dozen designs that have been particularly successful. Shirts featuring the Rockford Peaches and Cubbies baseball team have also been popular. Everything at Rockford Art Deli is original, hand-printed and made in the U.S. In her free time, Lindgren volunteers with iRead, a program through United Way where she reads and builds relationships with children in Kindergarten through grade 3. She also volunteers as marketing director for Ignite, an organization for young professionals. Left to Right: Rylie Berg, Andi Berg, Sarah Koons, Teresa Beach-Shelow, Krista Beach, Nikki Berg, Chris Magee. For Lori Berkes-Nelson, the glass is neither half-full nor half-empty. It’s three-quarters full. About 2.5 years ago, Berkes-Nelson was named the head of the park district’s fundraising arm. It’s no easy task securing precious donations, but one made easier given the district’s national reputation for excellent programs, services and facilities. Since 1979, the Foundation has raised more than $47 million to support the park district’s operations. 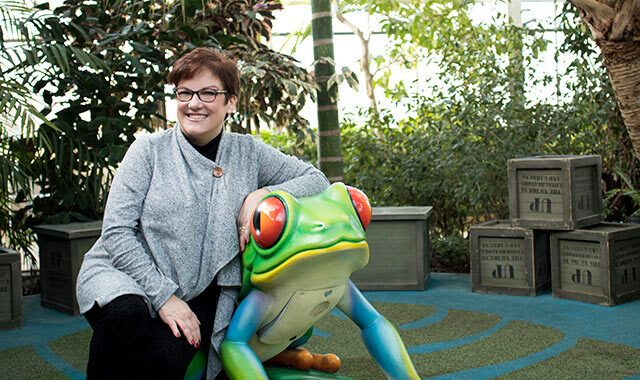 “Recreation for all to enjoy, playgrounds, camps, lessons, boat docks, youth sports, Nicholas Conservatory – none of it would be possible without our committed donors,” she says. She’s especially excited about new projects taking shape this year, including work on the Sinnissippi Rose and Perennial Gardens, Levings Lake, Silent Sports Trails, and the Kiwanis Club of Rockford Children’s Exploration Station along the Riverfront. The DeKalb native moved to Rockford via Santa Fe, N.M., in 1987. Berkes-Nelson says prior work experiences – Rosecrance, Golden Apple Foundation, among others – have helped shape her career. And that includes her family – husband Layne and their two teenage children, Maddie, 19, and Forrest, 17. Troy Flynn, Executive Director, RAVE, and General Manager for Coronado Performing Arts Center, BMO Harris Bank Center, Rockford Ice Hogs and Davis Park. Troy Flynn’s job is to entertain you. As the head of Rockford’s largest entertainment venues, Flynn is responsible for bringing to town some of the top acts – from rock shows to truck pulls. And he’s good at it. Flynn leads the Rockford Area Venues and Entertainment Authority, which manages the BMO Harris Bank Center, Coronado Performing Arts Center, Davis Park and the Rockford IceHogs. 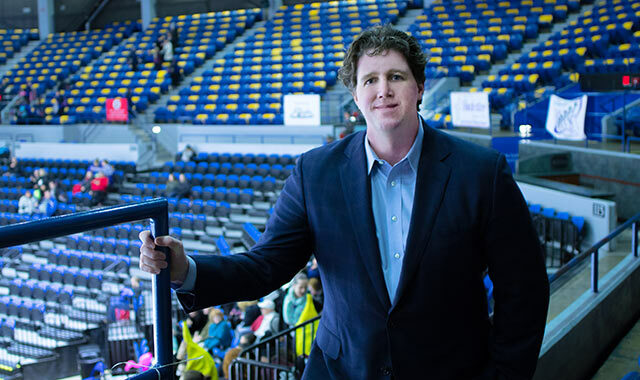 The Westchester, Penn., native fell into the arena business by accident. He went to college to study environmental politics, but to support himself he worked nights setting up stages, ice rinks and basketball courts for nearby arenas. Eventually he started managing crews. “I caught the entertainment bug early,” he says. Over the years, Flynn moved up to the big leagues, working at the Wells Fargo Arena and the Spectrum, home to the Philadelphia Flyers and 76ers. In 2008, he moved abroad for a year to open Spaladium, a venue in Croatia that hosted the World Handball Championship. When his work was finished, Flynn returned to the States and took a job with the Mullens Center in Amherst, Mass., and then the Prudential Center, in Newark N.J., home to the New Jersey Devils. That’s when Rockford came calling. In his free time, Flynn enjoys spending time with his wife, Lauren, and their two children, daughter Harper, 4, and son Shepard, 15 months. After traveling the world, Flynn says he’s ready to put down some roots. Rockford native Mike Webb doesn’t need to be in New York City to satisfy his cravings for high-caliber theater. 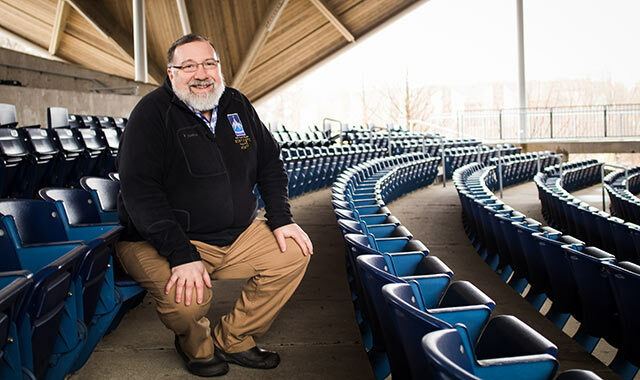 The former artistic director of Rock Valley College’s Starlight Theatre has always discovered great talent in his own backyard. When Webb was in high school, Starlight performances were held on the RVC lawn – a large contrast from today’s impressive outdoor Bengt Sjostrom Theatre, which Webb fought to get built. He spent his teenage years building and painting sets, not realizing how far Starlight would take him. After attending Rockford University for undergraduate studies and Michigan State University for graduate school, where he earned his Master of Fine Arts in Theater and Directing, Webb returned home and staged more than 7,400 shows in the course of his career. His retirement in December 2016 follows many accomplishments. Under Webb’s instruction, Starlight grew its subscriber base to more than 40,000 people. He was the first person to ever get an amateur license for “Phantom of the Opera,” obtaining the blessing directly from Andrew Lloyd Webber. During winter months, he’d work indoors at RVC’s Studio Theatre, a venue for more serious shows. Through his tenure, Webb directed all 36 of Shakespeare’s plays and 22 of Agatha Christie’s 25 productions. In reflection of a long, fruitful career, Webb says one of his greatest accomplishments was writing his own play, inspired by his daughter, Kaitlin, who has struggled with Rett syndrome her entire life. “I’ve had success writing other plays in the past, but this one meant the most to me,” he says. 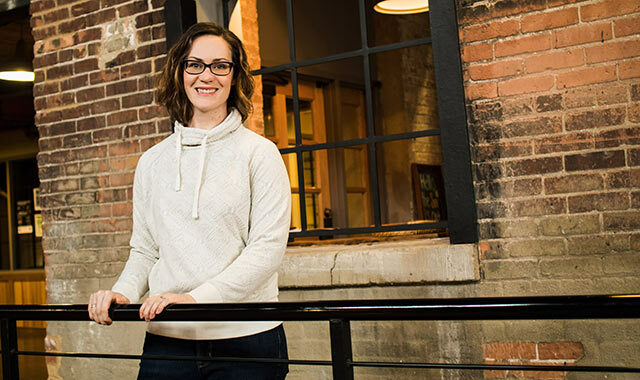 Jodi Miller is the kind of person who embraces a challenge. Naturally, when presented with an opportunity to take part in the revitalization of her hometown of Freeport, she jumped in with both feet. 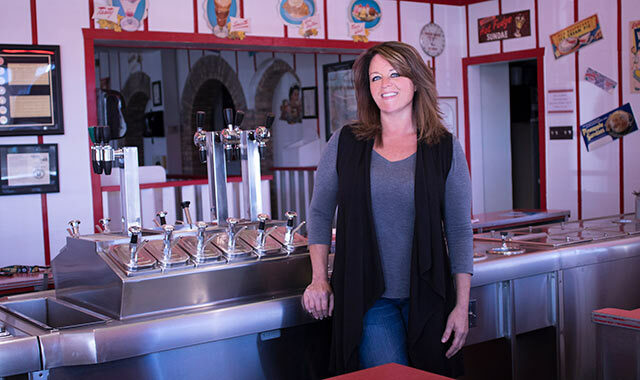 By putting into practice lessons she has learned as manager and co-owner of The Union Dairy, she hopes to help the city see the same kind of growth her iconic ice cream parlor has experienced. Miller has served as Freeport’s Fourth Ward alderman since 2015, and she serves as a Steering Committee Member for Collaborate Freeport, a branding initiative to improve the region. Miller also is a member of the Business Advocacy Committee with the local Chamber of Commerce. Additionally, she’s served as a committee member for the Tour De Freeport bike ride and sits on a committee for Freeport Downtown Development Foundation River District. And, she’s a core member of the grassroots effort to bring Freeport a multi-plex facility that would include a racetrack. “I want Freeport to be that city that can offer the younger generation the same kind of opportunities that my generation had while also embracing and preserving our community’s rich history and traditions,” Miller says. With her finger on the pulse of so many projects, Miller is impressed with the growing enthusiasm for Freeport’s future. There are plenty of people willing to the save the cute and furry animals of the world, but Rockford conservationist Barbara Williams has always set her sights on the unloved members of the animal kingdom. 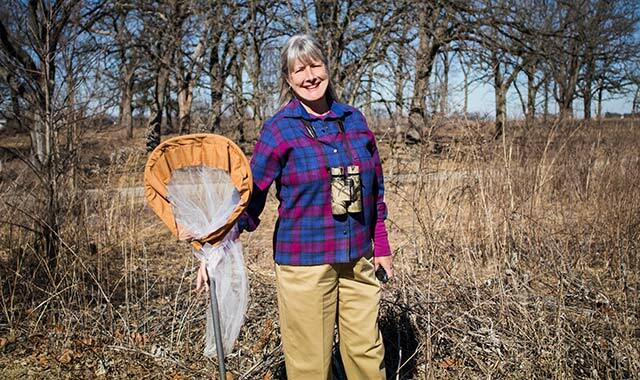 These days, the beneficiaries of her attention are bats, bumble bees and other insect pollinators. Ten years after retiring as a taxidermist at Burpee Museum, she volunteers her time educating people about the benefits of these misunderstood creatures. Breaking through misconceptions, so people can discover the wonder of her small subjects, is what drives Williams. Williams has a full slate of upcoming educational events scheduled for this year, including leading insect hunts through Anderson Japanese Gardens, a dragonfly walk at Deer Run Forest Preserve, and bat nights at several county forest preserves. At bat nights, she breaks out one of her favorite educational tools: the bat detector on her iPad mini. Running a burger restaurant may be a dream come true for James Purifoy, but the path he took to get there was a nightmare. About three years ago, the Rockford native opened 15th & Chris at the corner of 15th Avenue and Christina Street in Rockford, not far from the Orton Keyes public housing development where Purifoy grew up. In 1994, when he was 18, Purifoy was charged with aggravated battery with a firearm and spent 10 years in prison. While behind bars, Purifoy took college courses, including some related to the culinary arts. He was released when he was 29, but with a felony on his record, it was hard to find work. He bounced around to different jobs before starting JFP Trucking, a Rockford-based trucking company he ran for just over a year. “It was paying the bills, but it wasn’t my passion,” he says. His cooking was always a hit at cookouts and his guests always requested his homemade hamburgers. Inspired by the positive feedback and his culinary skills, Purifoy liquidated his trucking business and started a restaurant, setting up shop in a formerly abandoned building in a tough east-side neighborhood. Because of the location, Purifoy sometimes faces difficulty attracting patrons from other parts of town. So, last fall he purchased a food truck. 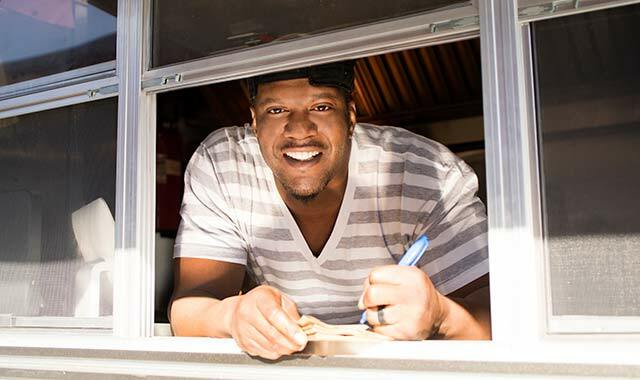 His 15th and Chris smartphone app allows Purifoy to alert fans to the food truck’s latest location. Customers can also follow him on social media. Ever since he was a child, Rod Beaudoin has been involved in entertainment, music and film. His career in entertainment began when he helped form Gerard Entertainment in the late 1980s. For many years, Beaudoin signed Midwest artists to recording and songwriting contracts with industry labels. In 2005, his passion for film came to the forefront of his creative career. In collaboration with Beloit philanthropists Ken and Diane Hendricks, Beaudoin founded the Beloit International Film Festival (BIFF) and became executive director. Over its 12 years of existence, BIFF has transformed the culture of downtown Beloit. Beaudoin watches hundreds of films a year. When planning the BIFF lineup, he has a team rate each film based on certain criteria. However, he doesn’t take that approach himself. This year marks Beaudoin’s final year as executive director of BIFF. However, he doesn’t plan on retiring just yet. Beaudoin is also the president and executive director of Hollywood Film Festival and plans to work in California full-time. He leaves behind a legacy of enhancing the culture of our region. Bob Sondgeroth was born into the education world. His grandmother taught in a one-room schoolhouse. His two older sisters taught and are now retired; his aunt and godmother were also teachers. 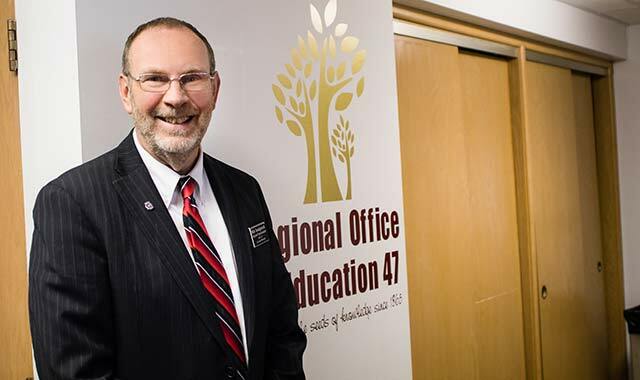 It only makes sense that Sondgeroth, now superintendent of the Regional Office of Education (ROE) for Ogle, Lee and Whiteside counties, would eventually lead professional development and training for 26 area school districts. The ROE also works with teachers and staff on classroom standards. When he was younger, Sondgeroth had ambitions of becoming a firefighter after he graduated from Illinois State University in 1978. His plans changed when he injured his knee during a house fire. So, Sondgeroth fell back to what he knew and loved: education. For nine years, he taught nearly every grade at East Coloma-Nelson Elementary School, in Rock Falls, Ill.
Sondgeroth eventually became athletic director at East Coloma, and in 2003 rose to assistant superintendent of the Regional Office of Education. He became the regional superintendent in 2011. Sondgeroth serves in an elected position; his current term ends June 30, 2019. In April 2014, Mike Greer moved to Rockford without knowing a soul. The young professional had just started a new career working as an IT operating systems consultant at United Health Group. The best and worst feature of the new job? Greer worked from home, preventing any face-to-face interaction with his co-workers. Fortunately, the 33-year-old has a social personality and a love for exploring Rockford. 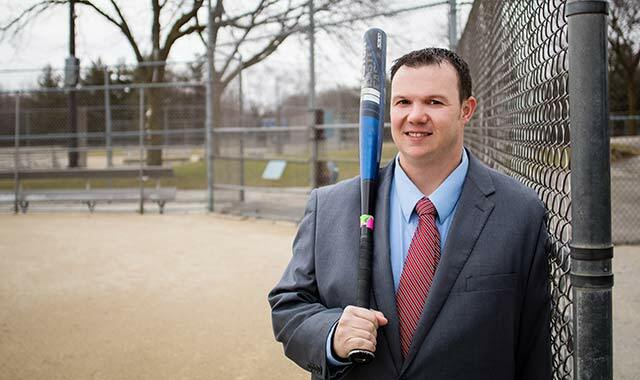 By word-of-mouth, he stumbled upon Rockford Young Professionals (RYP), a nonprofit organization dedicated to promoting the Rockford area while giving young professionals a way to socialize, network and make a difference in the community. Greer felt instantly welcomed and quickly became an active participant in the group. In October 2016, he became president of the organization. The highlight of Greer’s RYP experience has been organizing a charity event benefiting Noah’s Ark Animal Sanctuary. He’s also enjoyed volunteering at both the Rockford Rescue Mission and Feed My Starving Children, in Libertyville, Ill. On the social side, he’s helped to organize teams for competitive and pick-up sports, such as kickball, softball and broomball. Greer plans to stay in Rockford long-term. This spring, he’s opening his own business, called MindGames Rockford, an escape-the-room entertainment center with interactive puzzles and scenario-based games. This entry was posted on Thursday, March 30th, 2017 at 12:00 pm	and is filed under Features, Top Posts. You can follow any responses to this entry through the RSS 2.0 feed. Both comments and pings are currently closed.